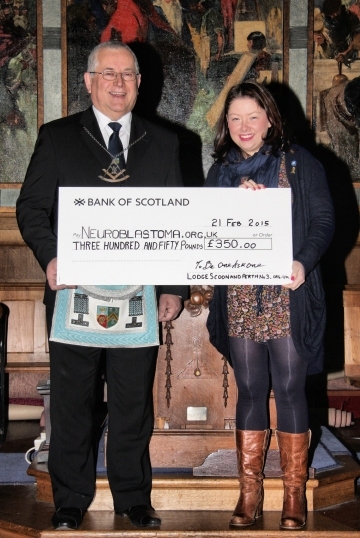 Brother David Robertson our IPM presented a donation on behalf of the Lodge to the Neuroblastoma Society at our lodge premises in February 2015. The £350 was collected for charity at a lodge dinner and the IPM was asked by the brethren to nominate a charity to receive the funds. Having lost a nephew to this aggressive childhood cancer Bro David nominate the Neuroblastoma Society which funds vital research into the childhood cancer.